In the event you are unfamiliar with the story, the Broadcaster was Leo Fender’s first two-pickup guitar, but the name was dropped after Gretsch pointed out it was already using the moniker ‘Broadkaster’ for a drum kit. 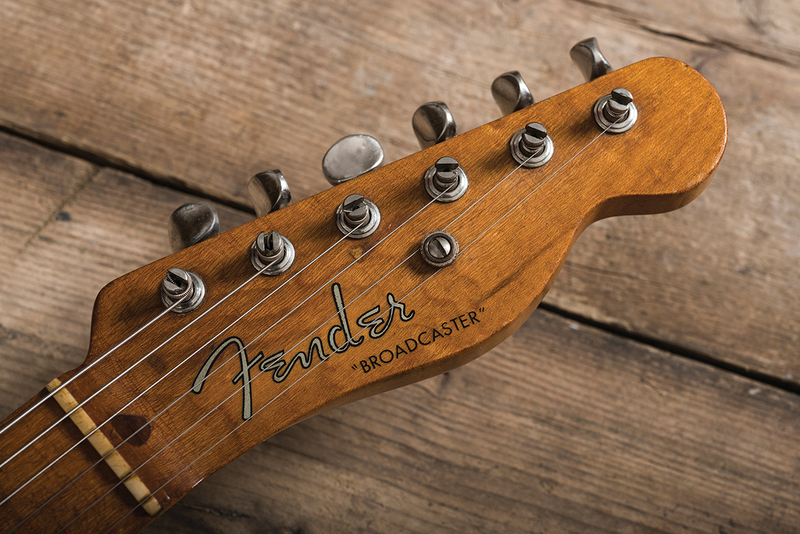 Fender began snipping the ‘Broadcaster’ bit off the decals until around September 1951 (as a result these are nicknamed the ‘Nocasters’), when the firm settled on the name ‘Telecaster’. It’s thought that Broadcasters were only made between autumn 1950 and March 1951. 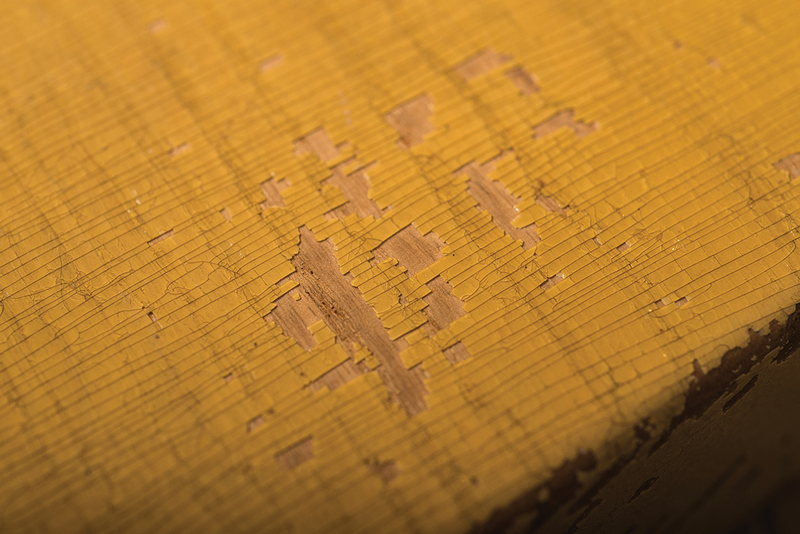 So, onto our specimen… ATB guitars purchased this guitar from a dealer, who had acquired it from the original owner. He was in his 90s, so as a ‘mature’ player during the 60s and 70s, he must have been immune to the modification impulse. As such, this Broadcaster has survived 100 per cent intact, with no finish touch-ups and stock factory wiring. 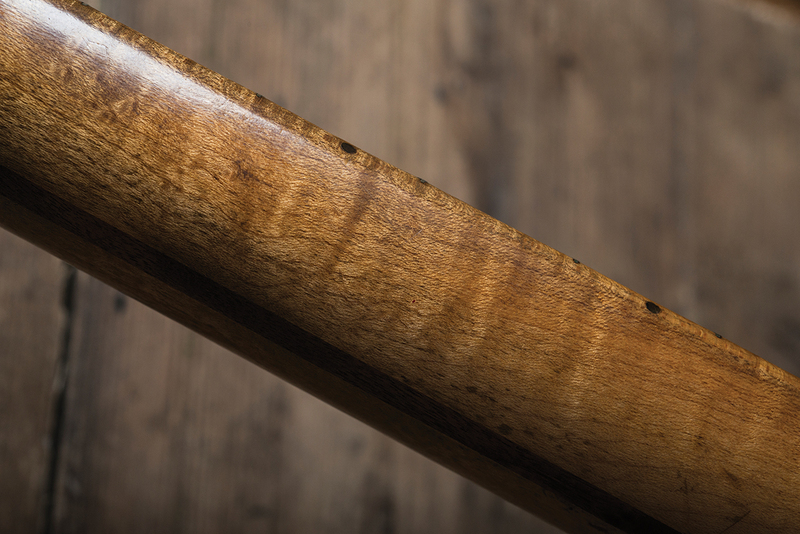 A remarkably thin finish covers a two-piece ash body with a join line running diagonally. Mostly intact, the lacquer is tightly and extensively checked with a yellow-blonde back contrasting with a darker, golden-mustard front and sides. 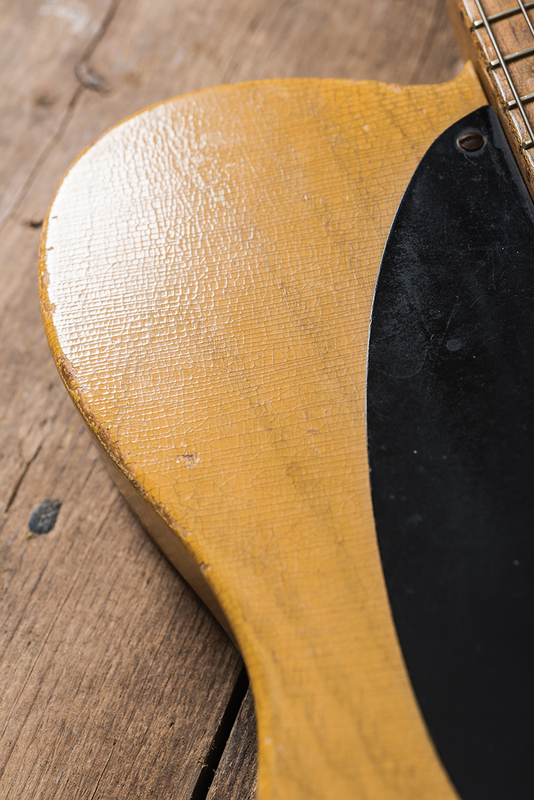 The darker front, bridge-cover tan line and absence of rust suggest that this guitar has lived in a dry and possibly sunny environment for most of its life. A rich amber hue enhances a subtly flamed one-piece maple neck with minutely checked lacquer. 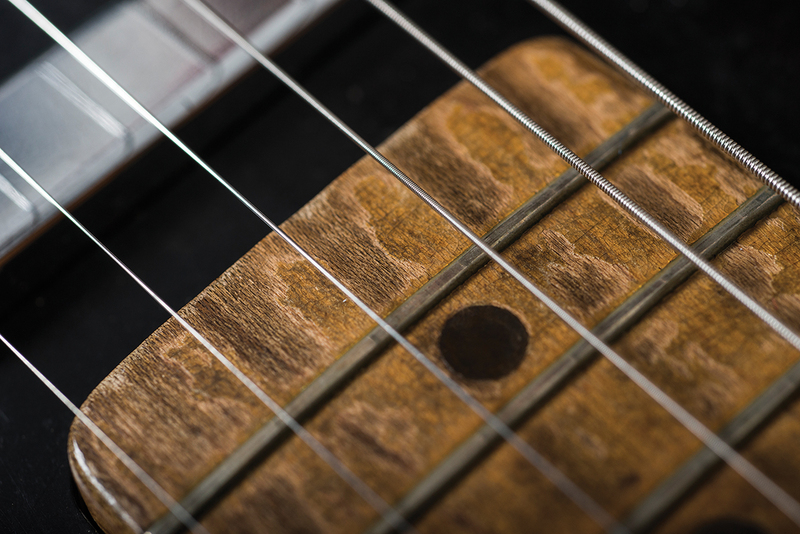 Fingerboard wear is confined to the first five frets and the last five, so that’s fingers and plectrums respectively; and it’s the same story on the back of the neck, with minimal wear-through and oxidisation in the lower positions. Having written of the life and times of Fender’s legendary neck shaper Tadeo Gomez in The Guitar Magazine only two issues ago, it’s serendipitous to be holding one of his necks in our hands. Some might describe this as a ‘biggish’ neck, but clubby doesn’t come into it. 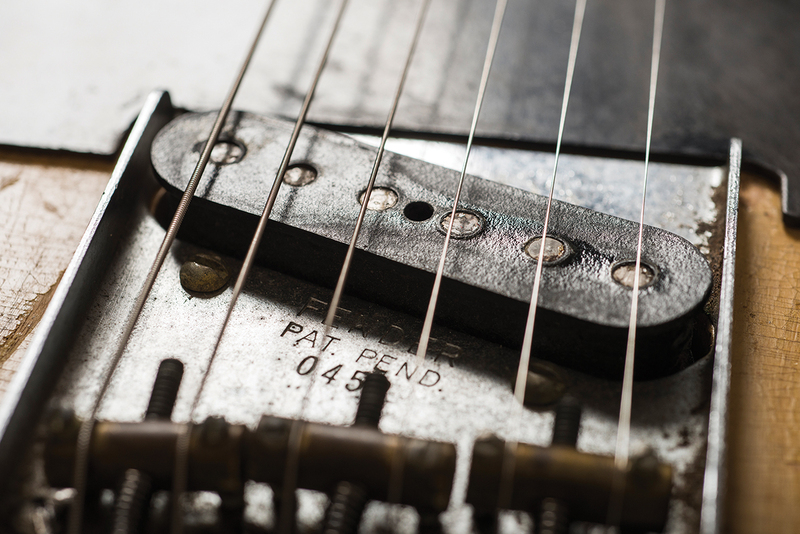 There is a V quality, but it’s not exactly the soft V of ’56/’57 or the hard and almost triangular V this writer encountered on one very early Telecaster. This is more of a rounded V that retains its shape – albeit in gradually softening form – all the way to the neck pocket. Just below the side dots, the carve abruptly changes direction. This manifests as a discernible line that runs all along the neck, but rather than leave this as a square shoulder, Gomez treated it as the starting point of a rollover that gracefully transitions to a tighter curve at the edges. At the body end, the line continues into the transition between the curved area of the neck and the flat sides that enter the pocket. 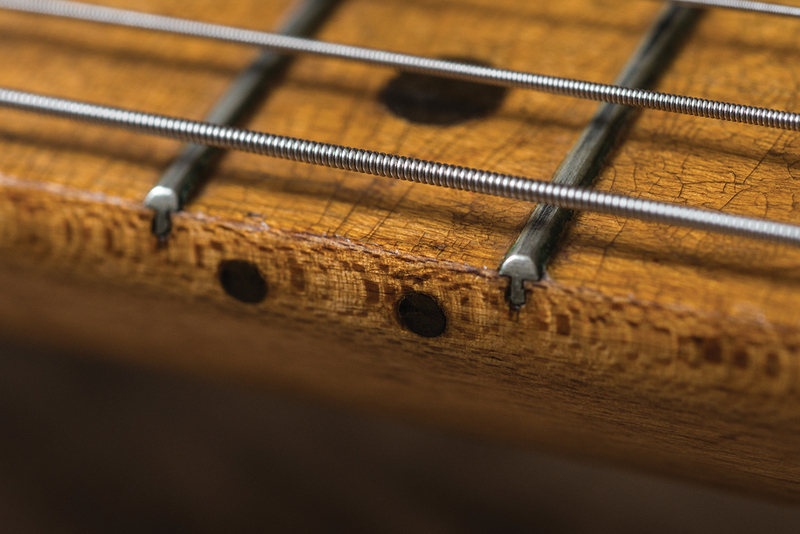 So, it’s unbroken from the nut through to the heel, and we’ve never seen a Fender neck quite like it. 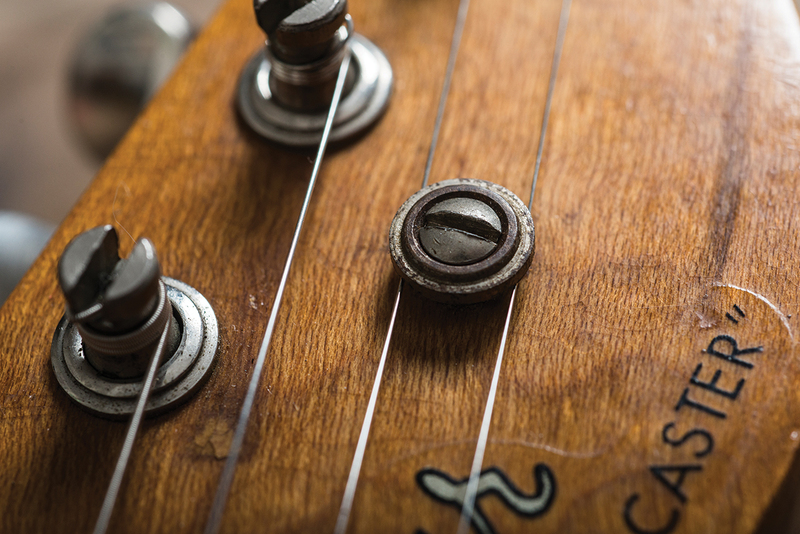 Even so, the ‘Tadeo taper’ refers to the transition from the back of the headstock to the neck, and we can see why it’s celebrated. The neck profile continues behind the nut and the neck and almost ‘disappears’. 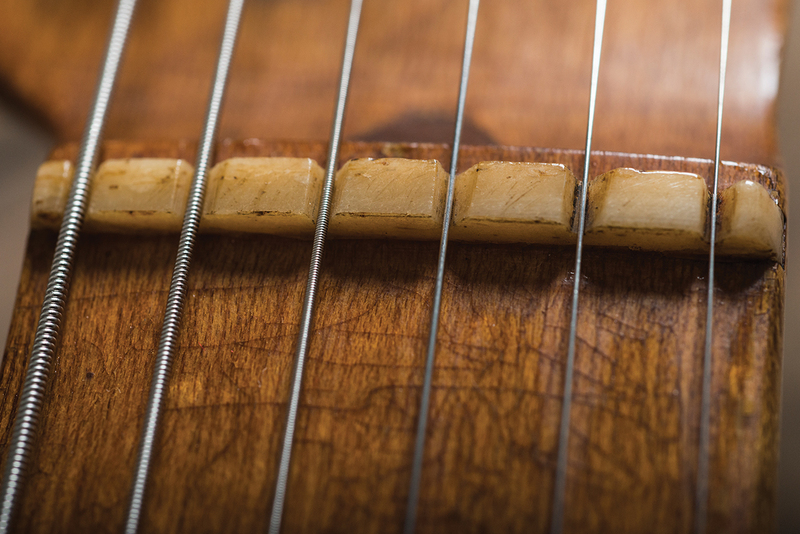 The transition is so graceful that there’s no discernible edge and the corner adjacent to the sixth (low E)-string tuner is rounded to echo the curve from the fingerboard to the headstock’s face. On this evidence, Tadeo Gomez elevated neck carving to the realm of sculpture – and this neck’s supreme comfort and aesthetic beauty blow us away in equal measure. Despite its familiar appearance, there are subtle details that set Broadcasters apart from later models, and they’re all in evidence here. The knobs are 0.8 inches tall, with rolled top edges and flat tops, and a semi-heavy knurl for grip. 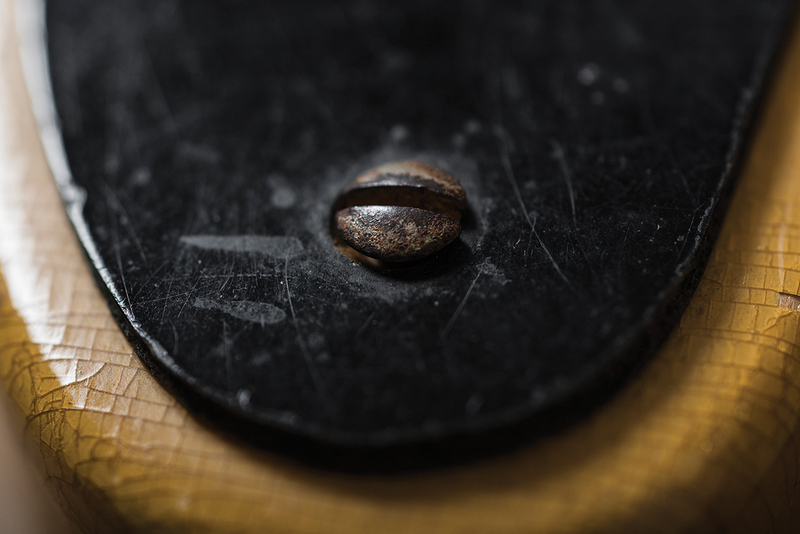 Staying with hardware, the saddles are all brass with flat bottoms, the Kluson gear housings are the earlier closed types and the jack cup is milled rather than pressed. 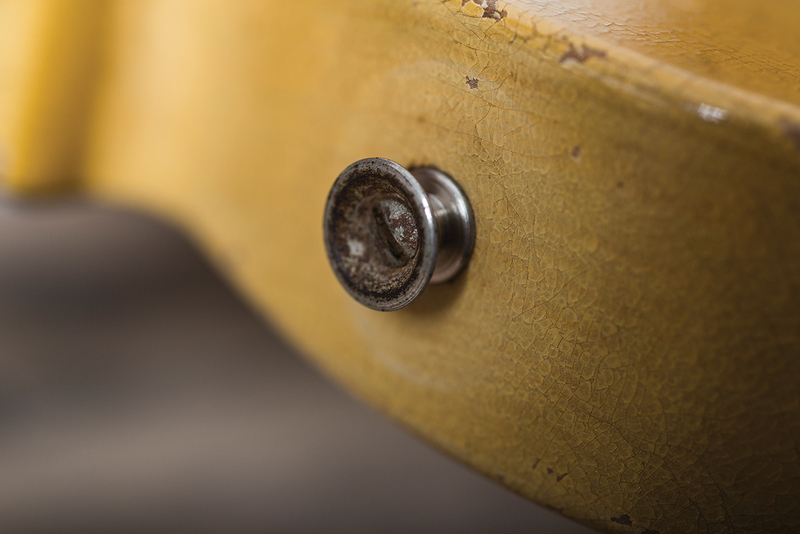 Check out the rounded plug at the headstock: it’s cut so close to the edge that they sanded through to it when the ’board was being radiused. Some suggest Broadcasters all had maple plugs, but this looks like walnut. 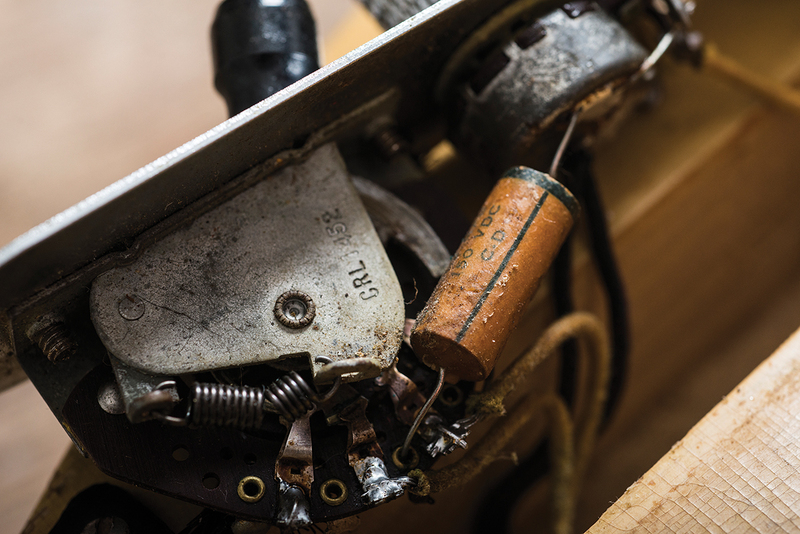 The nut is original and it’s cut just like the one on the 1956 Strat we featured in 2016 – with a triangular file rather than nut files. It still works fine, because the frets have never been changed. 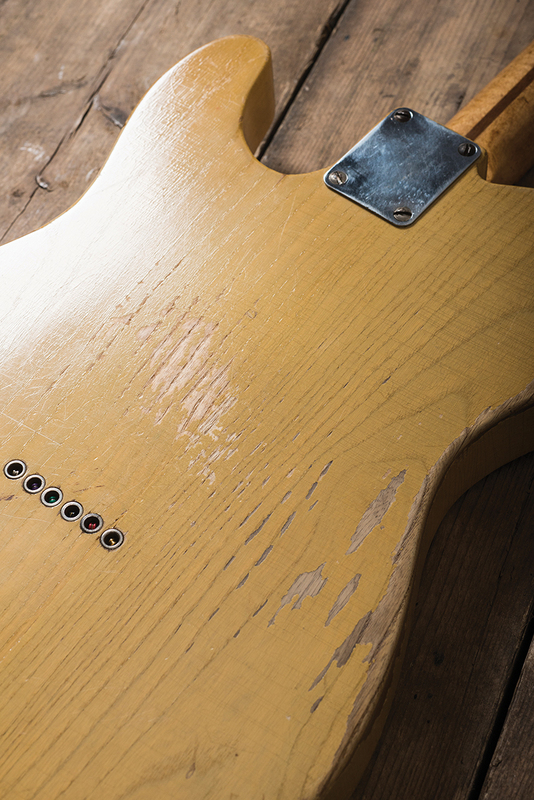 The first thing you’ll notice is the weight, because this body was made long before lightweight swamp ash was ‘invented’. While this subdues the transient response, it sustains like a fine Les Paul. You might imagine that the absence of treble bleed through a tone control would make the bridge unbearably bright, but the opposite is true. With a reduced resonance peak at the cutoff frequency, the treble is wide open, but sweet and never shrill. Plain strings have a clucky attack and there’s a warm balance; but there’s a slight lack of snap from the low notes despite tons of woody twang. 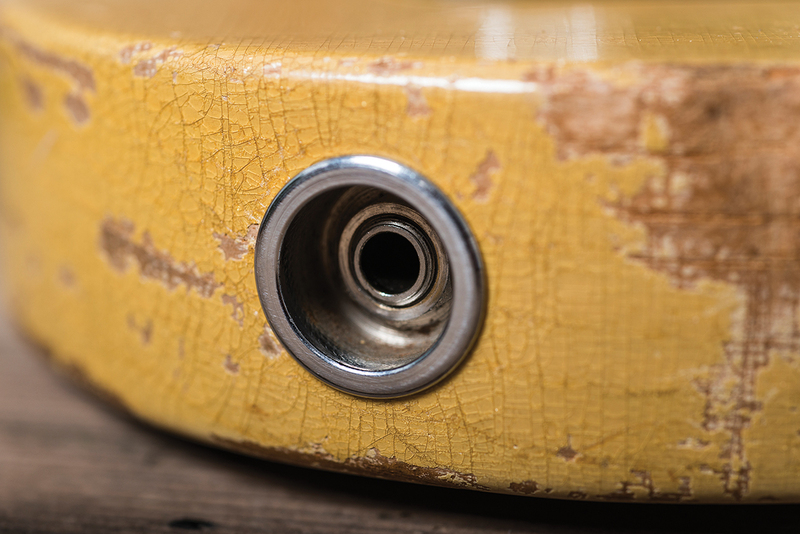 You also get a resonant quack that’s centred a tad lower than some Tele pickups – and with overdrive, this translates to a singing quality that’s far more Buchanan than Bakersfield. 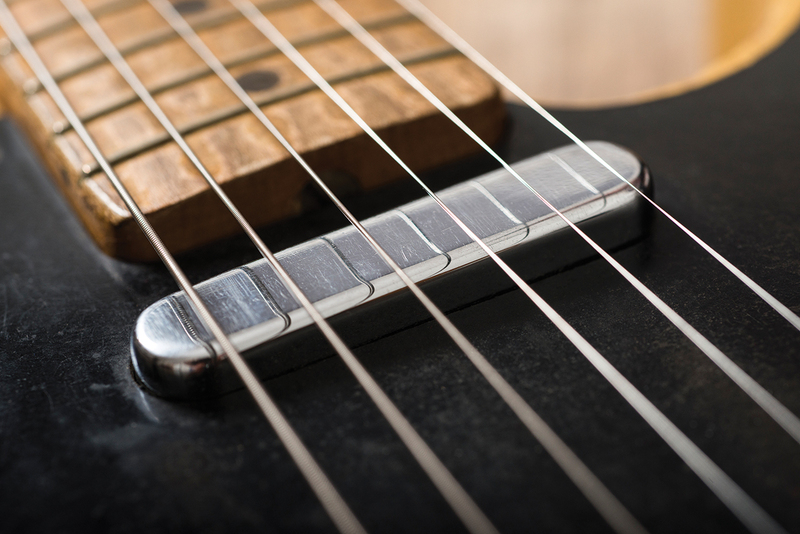 The neck pickup – in the middle setting – also benefits from the lack of tone control because it’s brighter, clearer and more usable than some. Even so, the bridge overpowers it somewhat and both might benefit from a bit of balancing. Back in the bridge position, the second knob functions as a mixer to blend the pickups together. It’s great in theory, but the effect is more subtle than expected. 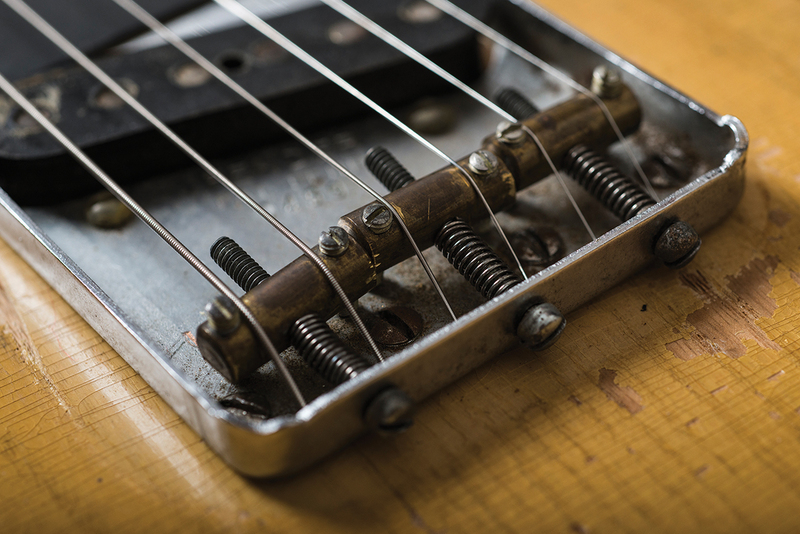 However, we discover that the neck is still in the mix even when the control is fully clockwise and wonder if the phasey scoop we hear from the fourth and third (D and G) strings on the ‘bridge only’ setting, and the barely discernible change in tone from the mixer control, may be attributable to 68-year-old electronics. The final setting is neck only, with preset treble roll off. 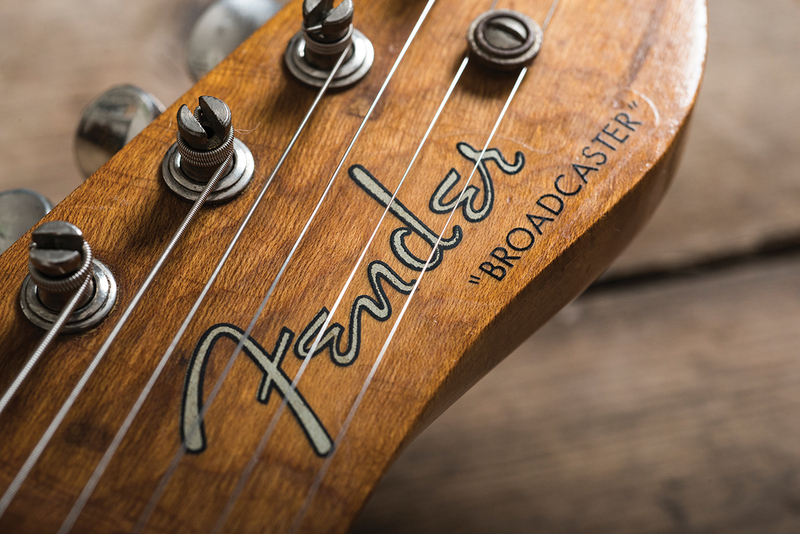 Fender intended this to be used for jazz chording and faux basslines – since the Broadcaster predates the electric bass. The treble and volume roll-off is extreme, so we wouldn’t expect this setting to get much use in a modern context. 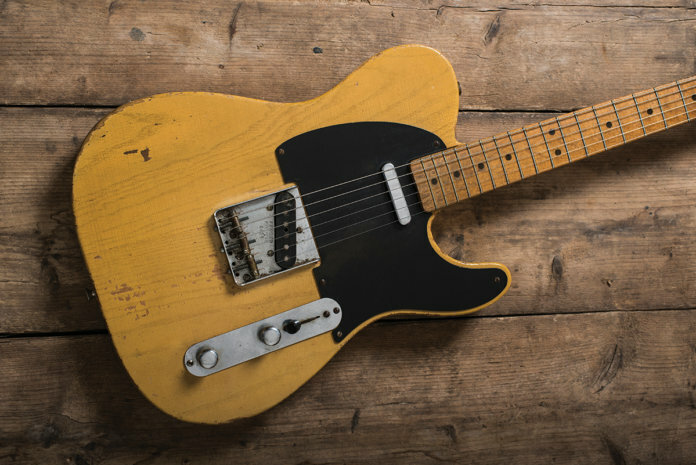 Besides its undeniable physical beauty, this guitar’s standout features are its wonderful bridge pickup, astonishing playability and what is surely one of the most gorgeous necks ever to have left the Fender factory. With a few minor adjustments and (dare we say it) some finessing of the controls, this instrument would easily cut it in the modern world. However, it’s arguably too valuable and historically significant to modify – though that’s now a decision for the guys at the Seven Decades show to make, with whom the instrument now resides. Head to www.sevendecades.com to find out more.